If you’ve ever taken your kids to the Children’s Museum located at The Forks in Winnipeg, then you will have been asked multiple times when you will be returning. I wanted to know why kids love the Children’s Museum, so I went straight to the source – my own kids, ages 6 and 4. In their own words (as well as some of my own), here is an explanation of child’s obsession with the Children’s Museum. Whether it’s special programming or a travelling exhibit, there’s always something new to discover, in addition to the Museum’s 12 permanent galleries. On our last visit, this something new was the Castle Builder! exhibit. If you have LEGO-lovers in your family, do not miss this chance to see amazing castle creations as well as to build your own. This can’t-miss feature of the Children’s Museum is a nod to the building’s former life as a diesel engine repair shop, originally built in 1889. Kids can explore the retired train engine outside and in. My kids loved to play conductor, flipping the switches and pulling the levers. This part of the museum is also a good exercise in taking turns, as all kids want a chance to sit in the conductor’s seat. There’s a structure to climb! The Lasagna Lookout is a cleverly designed play structure, where kids can “play with their food” – thanks to features like Spaghetti Forest. “I like that you can climb and there&apos;s noodles and food you can match and you can find these meatball balls that go boing boing." This area is a favourite for my kids, who are now big enough to climb to the top on their own, leaving us parents to watch from the bench in front the building’s large windows. And if your kids are a little too little, the Tot Spot might fill the gap – a safe place for kids two and under to walk, crawl and play in a miniature version of the Children’s Museum. Parents of little ones might want to bring an extra set of clothes thanks to the Splash Lab, the hands-on water table (waterproof smocks are available). Different water features offer loads of splashy good fun. “I like that swirly thing where you put a ball and it swirls it down kind of like a toilet." 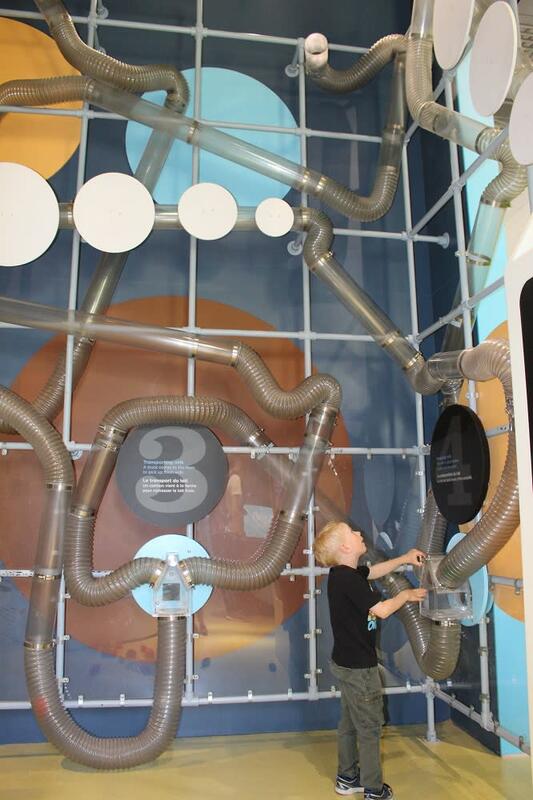 In the Milk Machine exhibit, kids are at the controls, as fluffy balls represent milk’s journey through a dairy. It’s hard to decide what is more fun – stuffing the balls into the tube’s opening, or turning the knobs to guess what path they will take and where they will come out next. The pin screen in the Mellow Marsh exhibit offers endless fun. Upon realizing that pressing their faces and bodies into the pins leaves an impression on the other side, it was race to see who could make the funniest face. The Pop M’art lets kids’ imaginations run wild as an array of art supplies is always available, as is an abundant supply of glue. “There&apos;s awesome art supplies that you probably don&apos;t see at other play places. And you can make things out of bottles and paper rolls and paper and egg carton thingies." This coming from a kid who always has an art project on the go – he was happy to make a robot out of a cardboard tube. And not just any slide, the Illusion Tunnel is a colorful test of forced perspective. Once my kids realized you can watch the slide from above, they took turns sliding and watching. “I like that slide thing that you can see through and it goes straight down." Travel Manitoba staff was hosted by partner the Children&apos;s Museum, who did not review or approve this story.